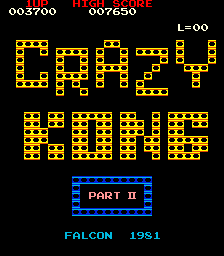 Crazy Kong (クレイジーコング, Crazy Kong?) 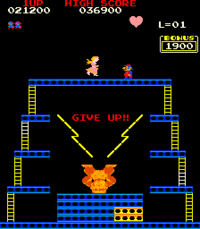 is not a bootleg of Donkey Kong. Falcon did have a license from Nintendo, but it was not for the United States. Crazy Kong was supposed to be for sale outside the U.S. (South America, Europe, etc. 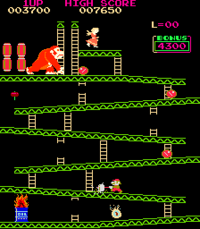 ), but the lag in production of arcade DK's by Nintendo for a 3 month period during 1981-82 made demand for any DK type game go through the roof. At this time, Nintendo of America was moving from NY-NJ to Redmond WA and there was a 4 month backlog on orders. This opened the door for the illegal Crazy Kongs to fill the demand. 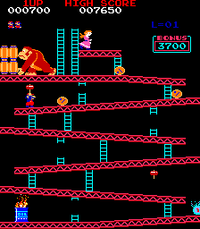 Approximately 20,000 Crazy Kong were distributed illegally in the U.S. 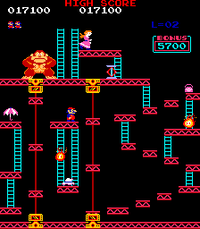 There are two versions of the original: Crazy Kong and Crazy Kong Part II; the differences of which are in minor cinematic artifacts and bugs, color palette choices and minor gameplay differences. 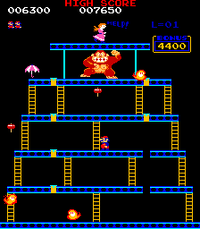 Crazy Kong Part I shows no copyright or company name on the title screen. Crazy Kong (parts I and II) runs on modified Crazy Climber hardware. In addition there are other versions of the game that run on Scramble, Jeutel, Orca, and Alca hardware. 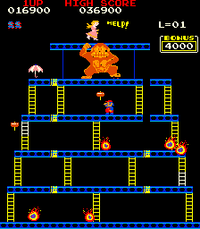 The official versions of game came in two different stand up cabinets that featured a large and angry, rather than comic, ape embedded in the artwork. The cabinets were created by Zaccaria. 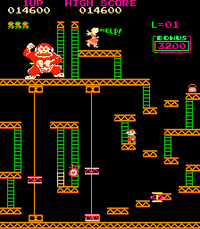 The main difference between Crazy Kong and Donkey Kong is the sound, and color capabilities. 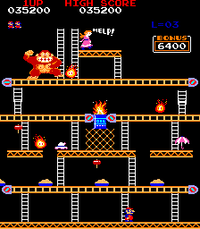 Crazy Kong ran on hardware that had the same processor as Donkey Kong, but with weaker video capabilities, and a totally different sound chip. Essentially, Crazy Kong had terrible sound, and some color oddities. The background music is missing entirely, and most of the sound effects have been changed. 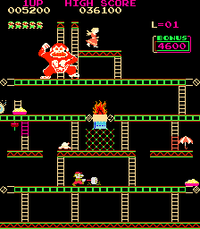 For example, in Crazy Kong, Mario makes a 'Hiya!' sound when he jumps, instead of the 'Boing!' that he makes in Donkey Kong. The graphics use slightly different colors, which change from level to level. The Kong animations are also different, and often do not match up with the in game action. There are also minor changes to the gameplay. Kong doesn't toss out nearly as many barrels, and there are other small changes such as gaps in platforms that were not in the original. The manner in which the elevators work has changed as well. 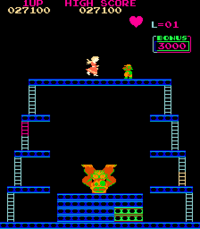 Most of the game graphics have been re-drawn; while Donkey Kong looks almost the same from a side view, his frontal appearance is noticeably different when he opens his mouth. In Part I, he is much taller and more menacing looking. In Part II, the palette has been corrected to tone down the "evil" look so that it's slightly more cartoonish, although he is still taller. 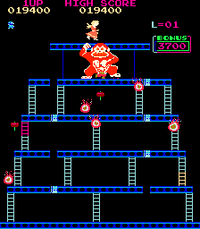 Oddly enough, there are a few transparent pixels scattered around Kong's body, including a noticeable hole in the right side of his head, in both versions. The Galaxian and Scramble versions have one of those Donkey Kongs that count the stages. The sound effects are altered and are generally more crude sounding. The background humming music is removed (except for the Scramble bootleg version) and Jumpman is given a digital sample "hugggh" sound when jumping. 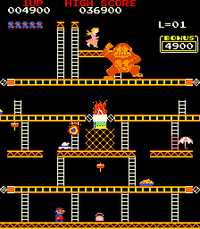 A lot of the in game sounds such as the "Kong chest beating" can also be found in the game Crazy Climber on those versions that run on its proprietary hardware. The Galaxian hardware bootleg is probably one of the most ridiculous versions ever: There is even more crude sounds and weird colors (Scramble bootleg has inverted colors and lower quality music). 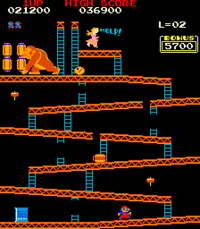 In Part II, during attract mode, a scene is shown where Crazy Kong is breaking out of a jail/zoo along with a rudimentary one channel audio tune. 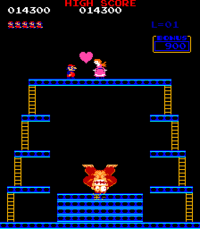 In Part II, while mario is climbing up a ladder, no barrel will fall down the ladder if Mario’s hand is slightly touch the upper floor. 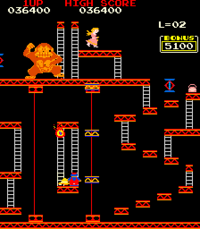 The first stage can be completed with the following cheat: Climb up the ladder at the far right of the bottom platform. 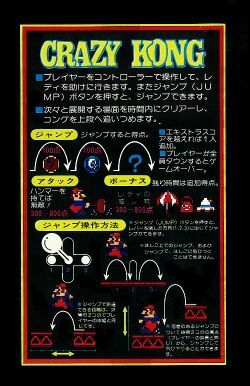 Make sure Mario/Jumpman’s back is facing you while tapping the joystick until his right foot is hanging over the ledge. Jump off the platform. If done correctly, he’ll drop through the floor below and the level will be completed. Note: this trick does not work on the bootleg version of the game that runs on Scramble hardware. 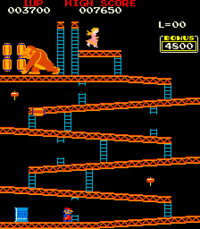 In Crazy Kong Part II: at 50m level the hammer can be left "unmaintained" on the right end of the conveyor belt. Grab the hammer and move Mario all the way to the right end of belt. When reached, "wiggle" the joystick to the left and right. If done correctly, Mario will drop the hammer at the down position and the hammer will stay there while Mario can walk away. Even if the hammer does disappear after short time, cakes/flames still get destroyed by hammer and give bonus points. If the hammer should drop in the up position while "wiggling" it can be grabbed again. Note: only work on level 2 or higher. The ghost-like flames that inhabit the 100m mark (the rivet level) are replaced with the oil-fire enemies that inhabit the other levels. After completing the 100m mark, the heart that would normally exist between Mario and Pauline is positioned right near the round indicator. 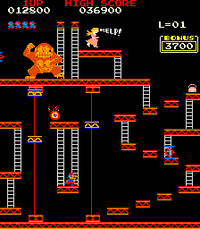 In Part I, on the 100m level, it is possible to touch and walk past Crazy Kong without losing a life. Below is a screenshot comparison of every level, including the ending cinematic. In addition to some of the changes between Part I and Part II, Stage 1 and Stage 3 have minor cosmetic alterations found only on Level 2 and beyond, that are not present in Level 1. This page was last edited on 19 June 2014, at 10:46.